Just because you're watching your figure doesn't mean you have to give up your favorite comfort foods. 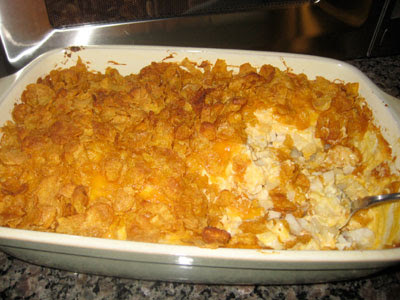 If you're longing for a dish that tastes like something mom used to make, you'll love my Oh-So-Slim Potato Casserole. Like all of my recipes, this one is so very, very simple, and so incredibly tasty. So, go ahead, try it for breakfast, as a side dish, or wow everyone you know at your next pot luck! Doesn't look "slim" at all, does it? Well, it is! In a large bowl, combine everything other than the corn flakes and spray butter, until mixed thoroughly. Coat a 9x13 baking dish with cooking spray, and spoon potato mixture into the baking pan; be sure to evenly distribute. Because of your blog, I'm finally able to cook healthy food that my family actually loves. I am a new cook and I made this last night. I must have done something wrong as I followed the recipe but the dish came out with a thick layer of water on the bottom and potatoes weren't cooked? I used a 28oz bag of the frozen hashbrowns that come in cubs with onions and peppers. Other than that I followed the recipe exactly and even cooked it for an additional 20 minutes. Can you help me find out what I did wrong? means of him as no one else realize such distinct approximately my difficulty. I know my visitors would enjoy your work. If you're even remotely interested, feel free to send me an email. else could anybody get that kind of information in such a perfect method of writing?